I’ll be honest with you, preparing artichokes is a little bit of work, and eating them takes some work too. But that’s kind of what I love about them. I don’t make them all that often, but I’m always happy when I do. For anyone who has never had a whole artichoke before there is definitely a method to attacking this delicious appetizer. Begin eating the artichoke by peeling one leaf at a time and scraping off the stuffing and meat of the artichoke with your teeth. As you work your way down towards the inside and the leaves get softer, you can grab a bunch at a time and eat the whole bottom half of them. Be careful though that you do not eat the prickly nettles that stick out from the heart. Instead, take a spoon and scoop out the nettles, leaving the very bottom of the artichoke and the heart behind. This is, of course, the reward (and best part) after all that work of eating the leaves. I think you are absolutely going to love this gluten, soy and dairy free recipe for a Panko Stuffed Artichokes with an Easy Lemon Aioli. 1 cup GF Panko bread crumbs Note: there are several brands of GF Panko breadcrumbs and any of them will work well with this recipe. My favorite ones are made by Kinninkinnick Foods. 1/2 cup vegan parmesan cheese Note: Parma Vegan Parmesan is gluten, soy and dairy free. Cut stems off of artichokes. Place upside down in a large pot and fill with water. Boil for 20 minutes. Artichokes should be submerged in water, so you may need to place a bowl or other object on top. Remove artichokes from pot. Let drain upside down for 10 minutes. Cut off the top 1/2-1 inch of artichoke. Trim remaining leaf tips if sharp. In a small saucepan, heat 1 tablespoon of olive oil and 1/8 cup Earth Balance. Add minced garlic, panko bread crumbs, salt, pepper, and any other fresh herbs or seasoning you desire. Stir until mixture comes together. It will most likely be dry, so add the remaining oil and butter. Add in the parmesan cheeses and lemon juice, and stir until lightly golden brown. Pull apart artichoke leaves and spoon mixture evenly inside. Place artichokes in a baking dish and add 1 inch of water to the bottom. Bake for 15 minutes uncovered. Place foil over the artichokes and bake another 25 minutes. Serve with Easy Lemon Aioli (see easy recipe below). To prepare mix together all ingredients in a small bowl. 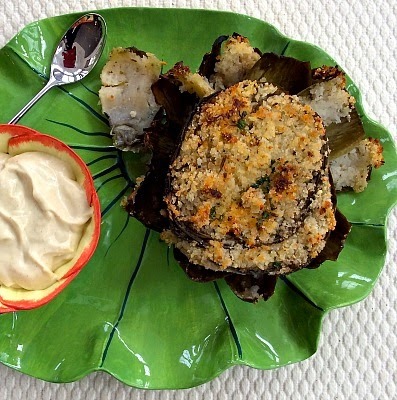 Serve with the stuffed artichokes.